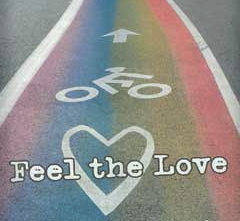 By: the generalThink that bikes and queer culture are rad? Well, then this might be the ride for you! Wear your queerliciousest (whatever that means to you) and be ready for a gay 'ol time. *People of all orientations and genders are welcome to Gears & Queers. *Gears & Queers is a positive, safe space. Sexism, racism, ableism, homophobia, heterosexism, biphobia, transphobia, classism, and cis-sexism are not part of the cultural norms of this group.